After years of considering it, I finally purchased a Mac last weekend. 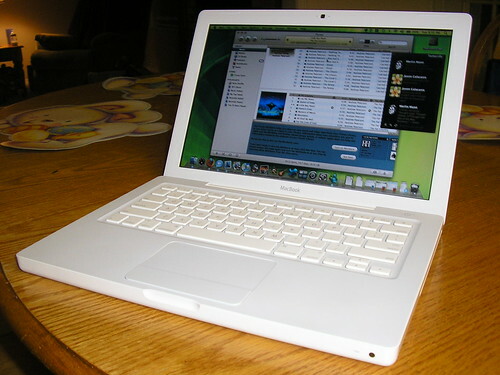 I got the 2.4 GHz white MacBook. I’m really enjoying it. Within minutes I was connected to my network at home browsing the internet and content from my Windows server. I’ve always been a fan on Linux. OS X is essentially a Linux operating system on standardized hardware so you don’t have to spend hours and hours trying to get everything to work right. It just works. It boots up and connects to the wireless network and internet amazingly fast. Browsing the internet is extremely fast. Connecting to and grabbing files from my Windows server works like a charm. Home video editing with iMovie. Compared to Windows Movie Maker, this seems like a professional video editing software. I stayed up wwwaayyy too late playing with this the other night. I hooked up my Sony Handycam to the firewire port and it immediately recognized it and with a couple clicks it was downloading the video. iTunes works so much better on the Mac. I should have expected this, being Apple software. I love the size. I was worried that a 13″ screen might seem too small, but it’s really not. And it’s so light to carry around. I have a 20″ widescreen Dell LCD at home so, as soon as I get a Mini-DVI to DVI converter I’ll be able to hook that up. I can’t seem to get the Mac to see the printer shared from my Vista desktop. I’m sure this has something to do with a Firewall setting on the Vista machine, but I haven’t been able to figure it out yet. If anyone out there has any pointers, I’d love to hear them! The Mail application seems to integrate great with GMail, but I can’t seem to get it to hook up to Hotmail despite reading several websites that tell you how to do it. Not a big deal, since Hotmail has such a great Web 2.0 interface, but it’d be nice to have it within Mail. I installed Twitterrific for using Twitter from the Mac. Seems like a great tool so far. Before I had used Twitter from Google Talk (the best Windows solution I could find) and so far I’m happier with Twitterific. For office I installed Neo Office. This is an OS X port of Open Office. I’ve edited several large Word documents from work using this and it works great. Microsoft Messenger. Most people at work use Live Messenger. I was very surprised to see that Microsoft had a Mac version. Works great but seems to lack the video functionality. Flip4Mac. Unfortunately, most of the home movies I have captured so far have been saved in WMV format. Flip4Mac is a tool that allows QuickTime to play WMV files. It’s supposed to let you import those into iMovie as well, but I haven’t been able to figure that out yet. Firefox. Safari was nice, and I used it for a few days. But Firefox is awesome and works as well on the Mac as it did on Windows. There are still a ton of things I want to try out on here that I haven’t been able to yet. All of the other iLife applications: iPhoto, iDVD, and iWeb. I’m especially excited about iDVD because I’ve had all of these home movies for years that I’ve wanted to burn to DVD but never found a method of doing so that I really liked and turned out like I wanted. Garage Band. This one is really exciting. I just need to get some quarter inch to eighth inch converters and I’ll be able to plug my guitar into it. I’ve heard good things about Garage Band and I’m anxious to to give it a shot. Windows. I still have several Windows apps I will not be able to get away from — Microsoft Money and Visual Studio 2008 being the biggest ones. I’m researching BootCamp, Parallells, and VMWare Fusion. BootCamp is the only free one, but I really don’t want to partition part of my hard drive for Windows. I guess I should have opted for a larger hard drive. I think I’ll try the trial versions of Parallels and VMWare Fusion and see how they work. Xcode. I’m really anxious to see what the development environment is like on OS X. It looks like I should be able to try out Xcode for free. Objective C looks like a whole different kind of animal than what I’m use to, but I’m going to give it a shot.